Local company Outside Ideas of Forestville has been selected to undertake streetscape upgrades between Victoria Street and the tramline. They have extensive experience working on major projects, including the ANZAC Memorial Walk, the Henley Square redevelopment and Adelaide Airport’s plaza. Outside Ideas have been responsible for some extraordinary work around the metropolitan area. This is good news as the rumours abounded that we were going to use Chinese pavers. 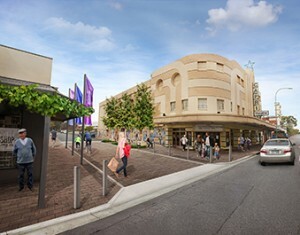 We have also engaged Adelaide-based company Groundplay to supply street furniture, including benches, bins and planter boxes, for the project which will result in improved pedestrian access and a beautified streetscape.